From the fly-out menu, select Create Account Family. From the fly-out menu, select Create an Account Family for each account without a family. The application will create a new account family for each account that is not already part of an existing account. From the fly-out menu, select Add an account manually. New options are now displayed. Type the account number for an existing AWS account. Select an account family that you want to associate with this new account. This option is useful if you have an AWS account that is not in the DBR. New accounts won't get integrated into the DBR until 24 hours after the account is used for the first time. The Create Account Family dialog box opens. The name for the account family, which will display anywhere in the application that references account families (such as the Invoice Generator). A contact email for the account family. If using the Scheduled Invoice functionality within the Invoice Generator, the application will automatically email the invoice to this address. The Account Family page allows you to mass-update these IDs so that you can modify them in bulk, each month. The Invoice ID will show on any generated invoice. User-defined number that represents an internal tracking number, project name, or chargeback code. The address for the customer you are creating within the account family. The address will also display on any invoice generated for this account family. Customer-facing notes or information you would like to display on the generated invoices. A two-digit value that represents the payment terms for the account family. The value is used to create invoices to populate the due date. You must provide a numeric value or leave this field blank. When you provide a value, it will override what you selected in the Invoice Generator. The invoice generator assigns default payment terms, but this field allows you to override those terms and provide payment terms specific to the account family. Select the AWS accounts you want to associate with the account family. Automatically creates a Multi-Account View (MAV) that only contains the accounts that are part of the account family. If you delete the account family, the MAV will also be deleted. A prompt indicates that the account family has been added. The new account family is listed in the table on the Account Families page. Click the new account family name to view the details. Notice that the application auto-populates the fields with your information. If applicable, go to the Add Custom Charges drop-down menu and select the custom charges you want to apply to this account family. This option allows you to select custom charges previously created on the Custom Billing Charges page. Only charges that you set to the account family value on the Custom Billing Charges page are displayed in this list. This section will only display accounts that are not in an existing account family. Where do I apply charges to account families on the Custom Billing Charges page? From the left navigation pane, choose Cost > AWS Partner Tools > Configure > Custom Billing Charges. Scroll to the Apply to charges that match these values section and select Account Family from the drop-down menu. 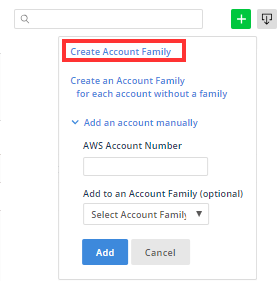 The list now only contains the default account families created by the application for each AWS account and your custom account families.